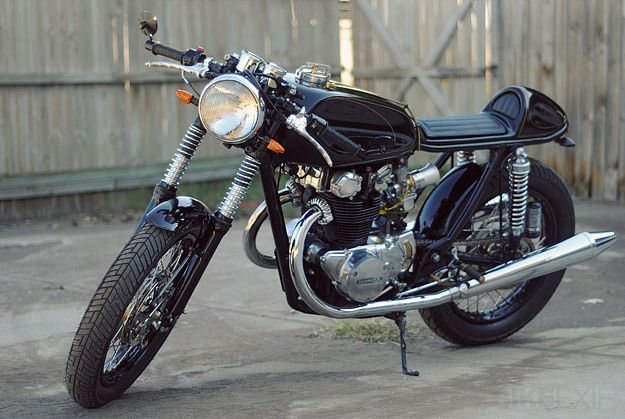 EXCLUSIVE The kings of the CB450 café racer are the guys at Dime City Cycles in Florida, who we’ve featured before. 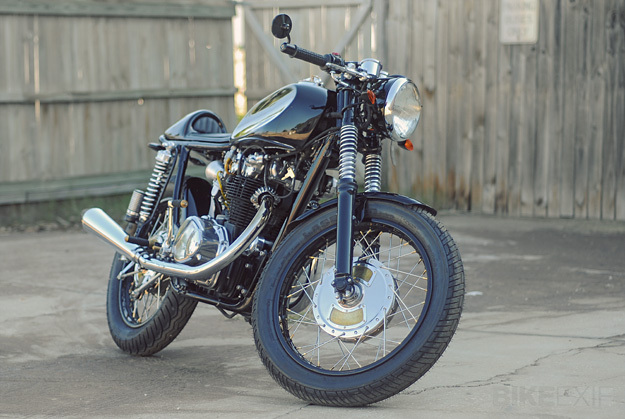 They’ll be getting considerably wider exposure soon, because this latest bike will be starring in the new Discovery HD Theater series Café Racer TV. The images here were shot especially for Bike EXIF and reveal a machine that started life as 1968 CB450, but has been heavily reworked. 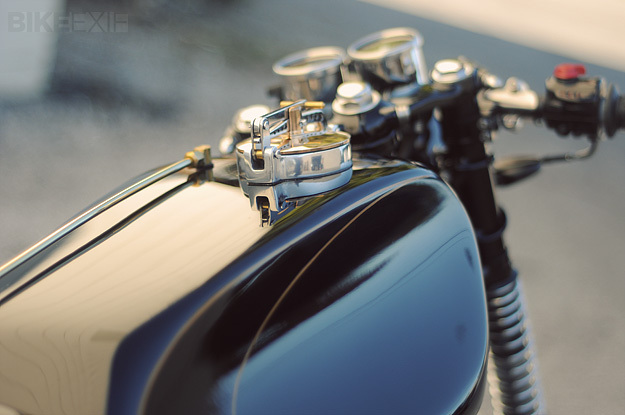 Substantial engine mods include ceramic coated and overbored pistons, a port and polish, custom cams and Dyna electronic ignition, while stepped headers and Norton Commando mufflers free up the breathing. A deep, luxurious color scheme of black and brass provides the show to match the go, with a nod to the Steampunk look without going overboard. There’s a one-up, hand tooled seat, a custom indented tank, 7″ light with visor, and a sweet Dime City ‘Manx’ rear end. According to According to DCC’s Jason Michaels and Herm Narciso, “The vision behind the Brass Café is one of purity, both in style and heritage. 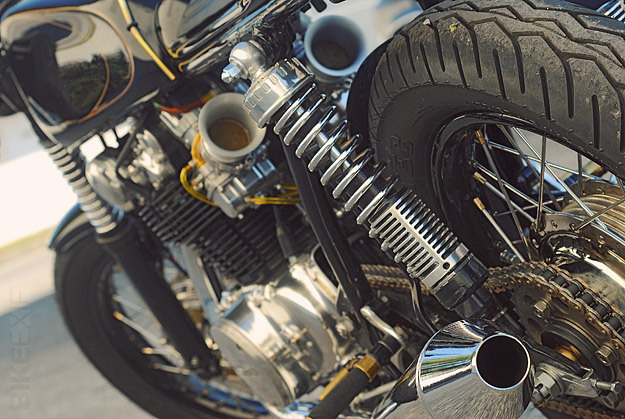 Dime City pursues classic forms in metalworking, paying respect to the builders of the 50s and 60s.” They hope to “inspire a renewed interest in the motorcycle as the ultimate expression of form and function,” and given the Discovery Channel’s clout, they might succeed. 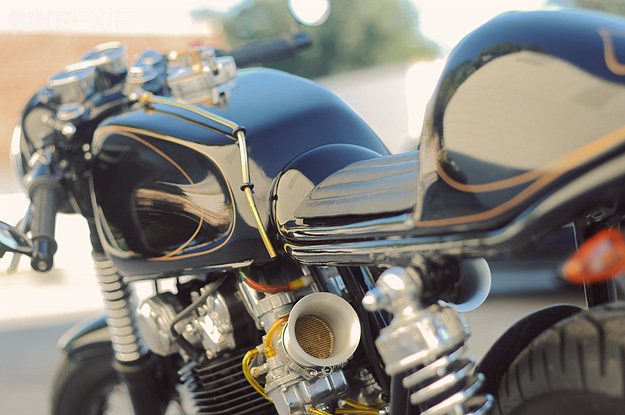 A sweet bike like the Brass Café should prove to the average viewer that there’s more to custom motorcycles than the antics of the Teutuls.